Paying for a university education is expensive, ranging from about $20,000 per year at a state university to more than $40,000 for out-of-state or private school tuition, room and board, fees, etc. From work-study programs to scholarships, there are many ways to lower overall costs. One strategy is to earn college credit for studies outside of the university's traditional classrooms. For example, many high school students take AP classes, which not only positions them well for admissions but also (potentially) earns college credits. A student can reduce overall expenses by earning credit hours through AP courses and similar methods. But be sure to confirm with university admissions officers, advisors, etc. that these efforts (and associated expenses) will actually move your student closer to graduation with a bachelor's degree. Take AP coursesMost likely, your child's high school offers AP courses on its campus or a facility in your area. Alternatively, guidance counselors or advisors may be able to make arrangements for online studies if such classes are not offered locally. The cost of an AP study guide and exam is approximately $100, a bargain price compared to university-level tuition. Each university has its own set of requirements for awarding credit for AP classes (see this list from Virginia Tech as an example), beyond the successful completion of the course. Check to determine general eligibility and required scores for credit, how credits are applied to degree requirements, and limits of credit hours awarded. Similarly, if a student participates in a high school's International Baccalaureate (IB) program, then she may be able to earn credit with strong exam scores. Demonstrate knowledge through placement tests and examsThere are a variety of placement tests and exams that allow students to demonstrate knowledge and earn credit for college courses. These include CLEP (College Level Exam Program), SAT II Subject Tests, DSST (Dantes Subject Standardized Tests), and Cambridge International exams. Many of these exams cost less than $100. Most colleges and universities have a list of courses for which a high score on the exam is eligible for credit. For example, view policies of the University of Tennessee at Knoxville, Western Washington University, and the University of Wisconsin at Madison online. Check with the appropriate academic advisor to verify that a high score on one of these exams meets requirements to earn college credit hours. Enroll in classes at the community collegeWhen considering the community college, you may envision earning an associate's degree and/or taking part in a college-transfer program (after high school), and then transferring credits to a chosen university. With this approach, you may be able to save approximately $5,000 on room & board plus thousands more on class expenses depending on the community college's tuition. But there are other ways to tap the cost-savings potential of the community college. Your student can enroll in an early college or dual-enrollment program rather than attend a traditional high school; such a program typically allows students to earn a high school diploma and college credits. Frequently, these programs are available for free or at a nominal charge to area residents. Check with your local school system to learn more. In addition, your college-aged child may be able to earn credit hours by taking one or two classes at the community college. For example, my husband took a class during the summer that was difficult to get at his university, enabling him to fulfill a degree requirement and stay on track to graduate. Before enrollment, confirm that the university and department or college within the university will award hours for the courses your student plans to take. The folks at College Board recommend talking to the admissions or counseling office at the community college and the transfer advisors at the intended university to assure that courses qualify for credit hours. Document learning through training and experiences to get credit for prior learning (CPL)Many colleges and universities award credit for prior learning based on an assessment of the applicant's activities in the workplace, community, etc. According to the American Council on Education, credit for prior learning may also be called prior learning assessment, experiential learning, evaluation of workplace training, or portfolio learning. This type of credit references skills and knowledge gained through real-world experiences such as community leadership roles, intense on-the-job professional training, projects and learnings associated with professional organizations, and travel experiences. At the University of Southern Maine, for example, students may document their college-level competency, knowledge, and ability to potentially receive credit via an academic portfolio assessment. Several years ago, I assisted a client in putting together a CPL portfolio. We documented his participation in a management training program involving hands-on projects, leadership coaching, and instruction; active leadership in a large civic club; and more. He presented the portfolio, participated in an interview, and paid a fee in order to earn college credits toward a business management degree. To explore this option, check with your university to gain an understanding of the portfolio requirements, fees, and timelines. Generally, the student will pay a portfolio review fee, possibly ranging from $100 to $500, plus charges associated with the credit hours earned. In some cases, the fee for earning credit may be as much as the equivalent tuition; as a result, this method may accelerate the path to graduation but not reduce its cost. By getting credit hours through these methods, your college-aged child may be able to graduate early (or at least on time), saving a semester's or year's worth of tuition; carry a lighter load of classes, freeing her to work or run a business while in college; have a more flexible schedule needed for a study abroad program; or take more advanced courses, increasing her value upon graduation. Note that you may not be able to use money in college savings plans for these expenses. Each type of savings vehicle has different requirements so check with your tax advisor if you plan to tap a 529 Plan, Coverdell, or UTMA/UGMA to pay for exams, portfolio reviews, etc. The 529 tends to be the most restrictive (limited to qualified college expenses to receive tax favored status) and the UTMA/UGMA, the most flexible (money must simply be used for the child's benefit). I definitely believe in learning for learning's sake. But I also believing in saving money if you can. 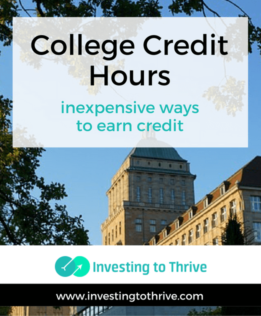 Getting credit without paying full tuition for credit hours can help your financial situation, enabling you to make the best use of dollars designated for education.